Edited by Jon K. Lauck. “The Corn Belt,” “America’s Breadbasket,” “The Heartland,” “The Bible Belt,” “Flyover Country”—all (except for that last) endearing nicknames applied to the region of the U.S. that lies between New York and Los Angeles, that region that coastal elites like to forget exists. In other words, the Midwest. Midwesterners are those Americans for whom ten-hour road trips are no big deal. We know what “detasseling” season means, and a good number of our teenagers have spent a hard summer with their feet buried up to the ankles in black Midwestern mud, earning a minimum wage for an eight-hour day of detasseling. We build house-sized bonfires for entertainment in the fall, know how to drive in fourteen inches of snow, drink pop, and eat casseroles and pasties. We generally go to church on Sunday. We’re also the “red states”—that swath of crimson that makes up most of the continental U.S., and which the coastal elite is just learning has to be reckoned with. We’re the Midwest, and we’re largely looked down upon by the citizens of both East and West coasts. We’re a bit backward, or so we’re told. And many of us have come to believe it. “The Rural Brain Drain” is a real thing, wherein our best, brightest, most educated, and most talented flee the cornfields of Illinois and Iowa for places like New York, Boston, L.A., or San Diego. But there was a time not that long ago when our best and brightest, instead of picking up and leaving, made a concerted, defined effort to stay put. This “Midwestern Moment” is the subject of a new book edited by Jon Lauck. Lauck is a faculty member at the University of South Dakota (a solidly Midwestern location), founding president of the Midwestern History Association, and associate editor of the Middle West Review. 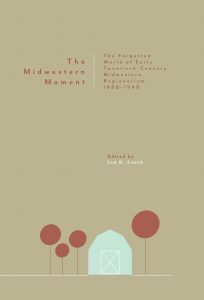 The book, The Midwestern Moment: The Forgotten World of Early Twentieth Century Midwestern Regionalism, 1880–1940, is published by Hastings College Press in Hastings, Nebraska (also solidly Midwestern). The book’s subject matter varies widely—everything from how corn became the predominant symbol of the region; to the fiction of Booth Tarkington, Ruth Suckow, Willa Cather, and Sherwood Anderson; the poetry of Jay Sigmund and Walt Mason; the “regionalist identity” of the Minneapolis Symphony Orchestra; South Dakota painter Harvey Dunn; and the fierce agrarianism of a certain segment of Midwestern Catholics. The unifying theme is that all of these wildly different individuals and institutions understood their artistic identity as firmly Midwestern, and sought to increase respect for the Midwest as a serious source of art, literature, and ideas. This is an academic work, well researched and heavily footnoted. Nonetheless, the phrase “highfalutin” appears more than once—always a good sign. Up until the Civil War, the Midwest was more of a short stopping-over zone for those headed West than a real region with its own identity. It was part of the “West” or “Great West,” and only during the Civil War—when the Midwest sided with the North against the South—did it begin to come into its own as a region. After the War, the citizens of the Midwest began to try to define themselves as a real place with things to contribute. In his introduction, Lauck quotes Albert Bushnell Hart, who wrote in 1900 that the Midwest “yields to no region in the world in interest, in romance, and in promise for the future. Here, if anywhere, is the real America—the field, the theater, and the basis of the civilization of the Western World.” As a mark of the region’s ascendancy, six of the seven presidents elected between 1860 and 1900 hailed from the Midwest. As time went on, the boundaries of the region became more fixed: Beginning somewhere in Western Ohio, they extend west as far as parts of eastern Kansas, Nebraska, and the Dakotas. Perhaps more usefully, as a New York Times story once defined the Midwest, this is the region where a high number of residents are fans of Central Division baseball teams. As the Midwest came into its own, its best and brightest began to take their inspiration from its fields, seasons, produce, and its rural communities. Societies of fiction writers and poets sprang up, foremost in Chicago, which in 1917 H. L. Mencken declared to be “the literary capital of the United States” and “the most civilized city in America.” The authors who made up these societies—Hamlin Garland, Edna Ferber, Clarence Darrow, even Jane Addams—knew that to be taken seriously, they had first to be known. And to be known, they had to glean their subjects from their homeland—they had to bare their souls. And so the artistic output of the Midwest began to take on its character, like a handful of dirt scooped up from an Illinois farm. New York had grown stale, these authors believed (critics like Mencken seem to have backed them on this). The public wanted new, fresh, earthy. Others took their cue from their roots. South Dakota artist Harvey Dunn became desired for his illustrations, but his prairie paintings are his true legacy. His paintings evoke the life he lived in the Dakotas—a realistic portrayal of the struggle and romance of pioneer life. There was also the group of Catholic Agrarian writers, who grasped that a true distributist solution to the problems of urban blight, the greed of capitalism, and the dwindling fertility of the cities lay in restoring a healthy network of sustainable family farms. Even Jane Addams seems to have taken much of her inspiration for the concept of Hull House from her childhood growing up amongst the poor in the small towns of Illinois, and began to favor doing things over thinking things. Indeed, it was the huge influx of immigrants into the Midwest (whom Addams was motivated to help) that sparked the concept of “cultural pluralism,” as the region wrestled with how to assimilate these wildly different people groups. These writers, artists, musicians, personalities, and activists all took their inspiration from the fields—quite literally from the earth. In his own, earlier study of the development of the “Midwestern Moment,” E. Bradford Burns writes that in Iowa, “intellectual and farmer alike understood that the soil shaped place and people. It constituted the seed from which regionalism sprang.” Nowhere is this more in evidence than in the cornfields themselves. The outsider finds the cornfields “flat, open, relatively featureless.” Even the born-and-bred Midwesterner complains about the drive through Iowa. But that flatness, that ability to see for miles and miles, also breeds some sense of infinity, of limitlessness. The vast expanse makes one aware of nature, of one’s own smallness in relation to Creation as a whole. The true Midwesterner feels uncomfortable in the mountains, because he cannot see the horizon. This sense of vastness and openness and possibility shaped the Midwestern Moment. So how did this Moment end? The authors in this book point to the tension that has always existed been New York and Chicago. There was, even at the height of Midwestern regionalism, a draw to the coasts, a sense that one hadn’t really succeeded until one made it in New York. Eventually, New York won. Or did it? If the accepted image of America is baseball and apple pie, then it is the small towns of Illinois, Iowa, Nebraska, and Missouri that represent the real America. If the accepted spirit of America is “rugged individualism,” fierce independence combined with a cheerful and honest openness, and if the pioneer represents all that is best in America, then it is the Midwest that has won, after all. The Midwestern Moment makes clear that the Midwest has left a great legacy, indeed. Nicole M. King is managing editor of The Natural Family: An International Journal of Research and Policy, and hails from Rockford, Illinois—definitely the Midwest.